As early as she can remember she has always been creating. She took a particular interest in crafts projects; needlepoint embroidery, crocheting, making greeting cards and even wallpapering the living room by herself. At twelve she finally got the sewing lessons she asked for (at the Singer store of course!) and designed and sewed her first outfit - a cotton gingham halter top and white bell bottoms - (hey, this was the 70's!) and topped it with a matching gingham scarf she designed sans pattern; the first JAX•HATZ! Jax put herself through art school in San Francisco where she learned about color and design, all the while designing and dreaming of hatz. She became a Visual Merchandiser (window trimmer) for the Emporium until its untimely demise in 1996, which left her career in limbo. This is where she likes to say that fate and destiny intervened. 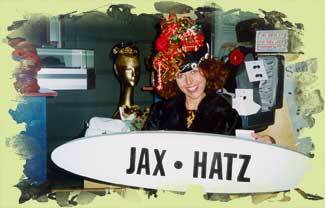 At a friend's urging and insistence that she should be selling her hatz and armed with the knowledge that enthusiasm and a creative spirit could probably make up for her lack of business acumen, she launched JAX•HATZ. Since its inception Jax has made many, many hatz - so many hatz she thinks lined end to end they would reach the entire span of the Golden Gate Bridge! With each hat is a story. It is the story of the woman who wore the hat, the places she went and the things that happened to her; perhaps because of THAT hat! Today she pours the sum of her experiences into her original designs and translates that into the handcrafted hatz she creates. 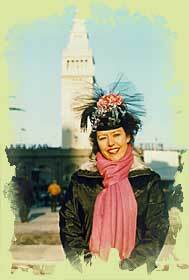 Since 1996 she has designed and sold her hatz almost exclusively at art & wine festivals and street fairs throughout the San Francisco Bay Area, Southern California and Arizona. With so many customers at those venues inquiring as to on-line sales, she felt compelled to join the revolution. With this web-site she is opening up her 'virtual store'! 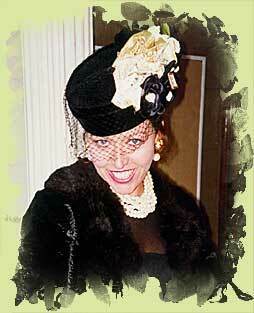 She feels infinitely blessed in life and thanks you for visiting her world of hatz!